Big size slabs are one of the increasingly innovative and fascinating solutions available for surfaces, and define a new vision in contemporary architecture. The installation of porcelain stoneware maxi tiles allows to improve the perception of space and the visual orientation, outdoing the classical horizontal and vertical dimensions. By substantially decreasing the quantity of interruptions of the design unit, floors covered with big size tiles can create environments that embrace the observers, and give a sense of three-dimensionality from every point of view. This new vision of the surfaces provides the designers with new sensory interpretations of contemporary architecture and creates visual continuity among the different environments, especially between indoor and outdoor spaces, enhancing space perception. Thanks to its flexibility and versatility, porcelain stoneware makes this design approach possible. It is the case of the Maximum collections by GranitiFiandre, in the 300x150 cm format, which can cover up to 4.5 m2 with a single, 14-kg maxi tile. Maximum by GranitiFiandre proposes several collections: marble/granite effect, stone effect, wood effect and cement/resin effect, each one available in different colours, finishes and shades. The marble effect highlights the solidity of the classic cladding, whose elegant aesthetics are always perfect for fine and luxury environments. Granite, instead, is perfect for industrial floorings and high traffic areas subject to stress, including mechanical stress (e.g. airports and stations). With its strong material impact, the stone effect proposes the ancient connection with humans and their first dwellings. This connection is still alive today in contemporary architecture, through hues and colours resulting from the best extraction traditions. The wood effect is an eco-sustainable solution dedicated to those who love nature and the warm aesthetics of wood essences, as well as the high-tech resistance of last generation porcelain stoneware. 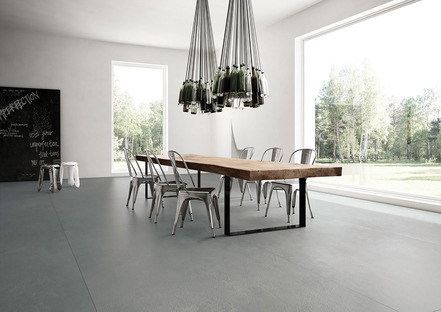 GranitiFiandre resin/cement effect has a suggestive material impact and a high number of variants that are perfect for metropolitan environments or greatly expressive traditional spaces. Among the variants of the resin/cement effect, the gallery shows the Aster Maximum collection, inspired by the urban style and characterised by an essential and well-defined design. The three colours of the Aster collection, Venus, Mercury and Moon Maximum, convey the strength of the cement effect, and at the same time recall the properties of earth and the colours of natural rocks and sands. The residential project in Salve, just a few kilometres away from the sea of the Salento (designed by Massimo Iosa Ghini) is a further proof of the versatility of the Venus Maximum maxi tiles. In a suggestive natural and Mediterranean context, surrounded by centuries-old olive trees and maritime pines, the project by architect Iosa Ghini led to the creation of a new residence perfectly integrated in the landscape of Salento, which has a layout recalling the local farms and that was built with the use of local working techniques and materials. These include "the local Chianca stone for the outdoor pavement, large porcelain panels for the floor, Acquarica tuff to clad the façade, Lecce stone for the internal fireplace and a dry stone barrel roof on the ancient pajara construction”. The Venus Maximum porcelain stoneware ensures a perfect balance between indoor and outdoor spaces, further enhanced by the presence of large windows facing the external equipped area, conceived as the ideal continuation of the “protected area”, that has been "floored and is a place furnished with handmade sofas and armchairs, where new relationships can be created".